My friends always make fun of me for never wearing jeans but it's mainly because I feel like you can't get as creative with denim. Also, living in a place where it usually doesn't go below 70 degrees, I have an excuse to wear skirts and dresses all year long. That's why I get super excited when I see jeans with gorgeous colors and textures. Also, extra points for being one of the comfiest pairs I've worn! I picked up the Minkpink sweater because of its geometric and eye prints but it's snuggly and great for an oversized wear. I think I'm doing pretty well with this outfit on the practical & comfy scale. Fab location and amazing boots. So cool. 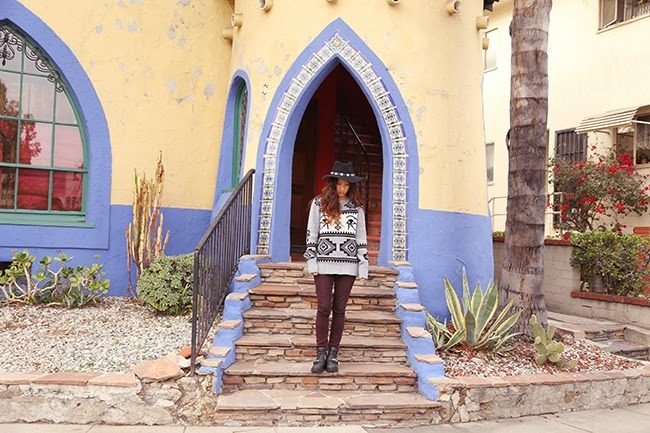 The geometric sweater with the hat is a perfect combination! lovely sweater!!! love the setting of the pictures! 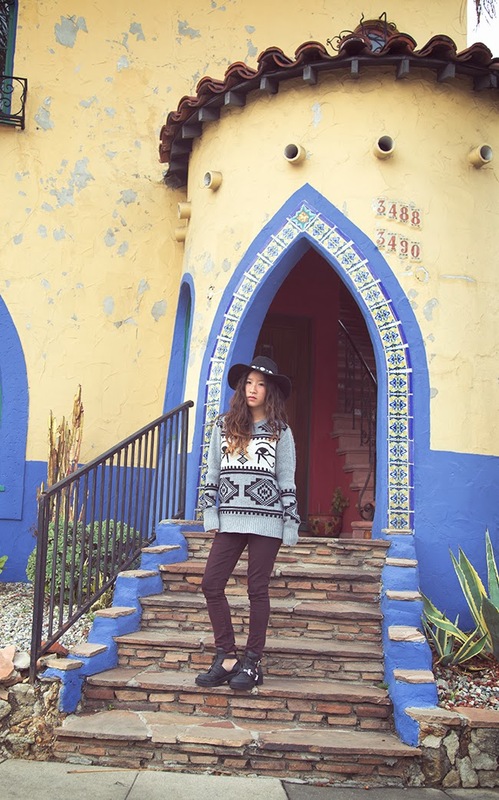 Love the sweater and hat, you look so cute! 100% my style! love it! nice look, love the boots!! Great outfit! Love your hat! Thanks for stopping by! Would you like to follow each other on GFC, facebook and bloglovin to stay in touch? Let me know, thanks! Love that look!!! such a nice sweater..really looks amazing! !